Would NEVER deal with this company again! Rude. Incompetent. Ignores emails. Is there much more to say? I was invited to review the ELECLOVER Cree 800 Lumen Bright LED Flashlight only to never receive the product. Now, I’m okay with being invited to review something and then having a company decide to go in another direction – that is marketing after all now isn’t it. What I’m not okay with is not being informed that they’ve decided to go in a different direction. It’s rude and unprofessional, which can only lead me to conclude that they do not treat their customers well. With that having been said, I do have to state that this is my own personal experience. And that I actually never received the product, which is why you are not reading a review of the ELECLOVER Cree 800 Lumen Bright LED Flashlight. 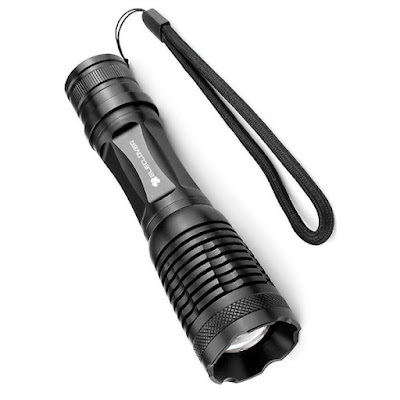 If you are interested in trying the ELECLOVER Cree 800 Lumen Bright LED Flashlight, it sells for $17.95 on Amazon.